Much like a staid business suit, business laptops tend to be low key. 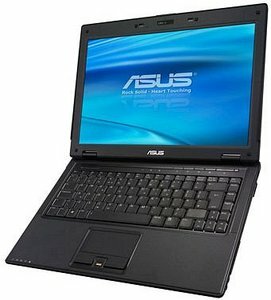 The new B80A-B1 ($970 street) from ASUS breaks out of that mold; it can do more than just send e-mails and run spreadsheets. Now, some corporate bean counters may balk at purchasing a laptop with all the bells and whistles of the B80A-B1, particularly when capable basic systems like the HP ProBook 4510s cost almost $300 less. The ASUS B80A-B1 is like your job interview suit, a solid investment but nothing too exciting. T5800: Entry level dual core processor based on the Merom core without Virtualization support and a low maximum temperature.